Being a newcomer to our area, you need not be apprehensive of your move. Our area is truly an enchanting region of the Deep South, modern but with the air of genteel hospitality, offering all the amenities and life-style of living in Florida, yet noted for retaining its small town southern charm. Located in Northwest Florida and sometimes referred to as the "Emerald Coast", the "Pan handle", or the "miracle Strip", our area's beautiful emerald waters and sugar white beaches of Navarre, Pensacola Beach and Perdido Key are unmatched anywhere along the U.S. Coastline. 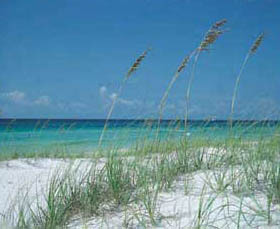 Pensacola is Florida's oldest European settlement, rich in history and natural beauty. The city streets are lined with century old oak trees draped with Spanish moss. Sea oats grace the sand dunes, wildflowers abound, winter brings camellias in all their glory, and with the spring the azaleas blanket the area in striking beauty. In an area where the landscape changes continually from lush, beautiful countryside to glorious beached graced by the Gulf of Mexico; from the graceful old mansions restored to their original southern beauty and charm to the striking modern offices glistening with chrome and glass; there is one thing that makes this area of the country such a favorite-it's the people-perhaps the greatest "natural" resources of Escambia and Santa Rosa Counties.